Our best-kept secret is out of the bag! 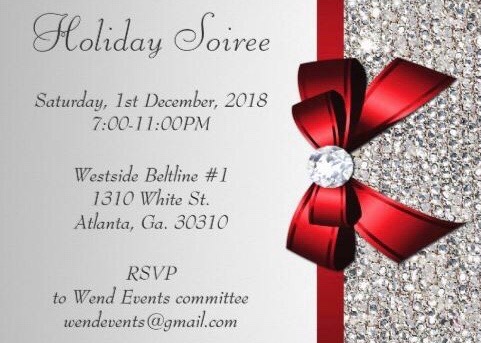 We are pleased to announce WEND’s Holiday Soiree 2018. Join us December 1, 2018, 7:00-11pm at 1310 White St. for an evening of festive fellowship. As a WEND Member, please enjoy two adult beverages, with our compliments. Non-members, please prepare a $12.00 donation upon entry to receive 2 beverage tickets. Can’t wait to see you there!